We can’t stress enough how essential a blog is to your business and online identity. If you already have a blog, then congratulations, you are on the path to success! If you haven’t set up a blog yet, we highly recommend that you do create your own blog, so you can start your journey to attracting more visitors and engaging with your audience. If you are indeed a newbie to blogging, we have several other blog posts that can help set you up. Take a look at our tips for starting a business blog and once you have mastered that, we encourage you to get even more advanced with these next steps! Whether you are blogging for your business or for a personal blog, these tips will come in handy to optimize your posts even further. Let’s face it, we all want our blogs to be read, or else what’s the point of having one? Using this advice, you can ensure that your blog is on the right track to being the best it can be. Link your posts to articles, websites, and other blogs. This helps your information remain credible since you are showing your readers your source, but you are also making it easy for them to check out additional resources. We suggest linking if you mention someone else’s blog, a specific blog post, or a website / article. At the bottom of each post encourage feedback by asking your readers if they have any questions or comments related to your post. Make sure to stay on topic with your responses and be polite. Having a comments section is a great place to create relationships with your readers and receive useful feedback to make your blog even better. Keep digital copyright in mind when selecting an image for your post. Cite the source for each image you use, or consider subscribing to a photography agency (like ShutterStock), so you are positive that any photo you download is allowed to be posted on your blog. Share your posts on social media to expand your audience and drive traffic to your blog. Try making your posts visually engaging to increase the amount of clicks-throughs by using fun images and catchy headlines. It’s great to write about whatever comes to your mind, but don’t forget about optimizing for search engines! 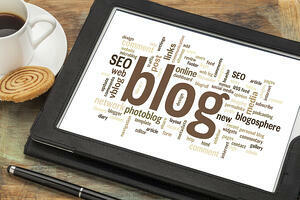 Keeping SEO in mind when you write will help increase the visibility of your blog on search engines. Use SEO-friendly software. We optimize our blog posts using HubSpot’s awesome SEO tool. You simply add the keyword(s) you are writing about and it assesses your entire article and points out the best areas for implementing your term. Going through this process before we publish ensures that each post is SEO optimized. Plan your posts out ahead of time so you can focus on your selected keywords and keep your content relevant, remarkable and non-robot sounding. Use headers and subheaders to organize your content for easy reading. Bullet points are also a useful formatting tool to keep your post easy to read and digestible. Use anchor text to link parts of your post to other relevant content. It’s also helpful to include internal links so you can redirect readers to pages on your website or previously published blog posts. Like we always say, create remarkable content. Not only will your readers appreciate what you say, but they may also link to your post in their articles. Write captivating titles to attract readers and increase social sharing. Titles act as the headline of your post. If they aren’t enticing then they may not attract as many views as the content deserves! Keep in mind that having more keywords will not produce a higher ranking. Focus on one really good keyword and create valuable content around it. Now that you’ve written (and published) all this great content, you may think that’s the end of that road. You could just stop at this step, but there are many ways to get even more from your content. Schedule and scatter social media posts throughout the next couple months. You can create several snippets of just one blog post to make social posting much easier. Refresh an old topic by rewriting it to include some updated tips and keywords and then republish. Post your content to LinkedIn as your business or an announcement in a relevant group. Create an infographic using your original content. The steps to a successful infographic are: tell your story in a concise way, have a visually appealing style, keep it simple, size it appropriately for your platform, include accurate statistics, optimize it for shareability, and cite your sources. Create a presentation with your content and upload it to SlideShare. Not sure what SlideShare is? It’s a platform that allows users to easily upload any presentation, infographic or document to be shared among the site’s community. Turn your content into a webinar. Not sure how to do this? Check out HubSpot’s tips on how to set up your first webinar. Design an eBook with your content and create a campaign around it. Creating a premium content offer will definitely increase the life of your content and even help you generate some new leads.